It’s a gorgeous journal packed with fine writing, and I urge you to pick up a copy if you’re able. So! It is 2013! I bet you noticed that too, didn’t you? Regular blog service is up and running again, including my plans to continue linking to other people’s fiction online, although I am now thinking of doing it every other week rather than weekly because it turns out I still don’t really have too much time to devote to blogging. My story “The Queen in the Yellow Wallpaper” will appear in a forthcoming British Fantasy Society horror anthology edited by Johnny Mains. Check out this TOC of awesomeness: Angela Slatter, Robert Shearman, Adam Nevill, Alex Hamilton, Thana Niveau, Muriel Gray, and Stephen Volk. 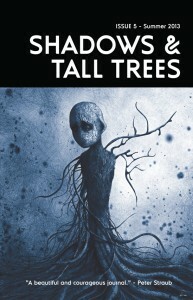 My story “Widdershins” will appear in issue #5 of the gorgeous journal Shadows and Tall Trees edited by Michael Kelly. So far my fellow authors are Daniel Mills and Gary Fry. And finally, my story in the September/October issue of Fantasy and Science Fiction, “Where the Summer Dwells,” received a nice nod from Lois Tilton over at Locus as one of her favorite stories from 2012.